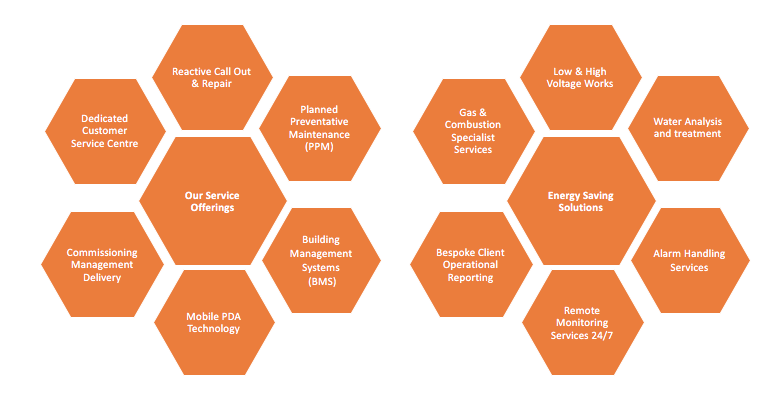 We design, build and operate Decentralised Energy Solutions to meet current, and future, energy needs. More and more public and private sector organisations are turning to the cheaper, greener option of a Decentralised Energy solution, and nowhere is this more true that in London. By generating heat and power locally, we can help lower both residents’ energy bills and CO2 emissions – virtually prerequisites for developers in the capital. District energy is not a new concept and the roots race back to hot water heater baths in ancient roman times, more recent examples in London would be during the regency period where central coal fire furnaces would be built in London squares and hot water distributed to houses around the square. In simple terms District Heating is the mechanism for distributing heat generated centrally. It provides higher efficiencies and better pollution control that localised boilers. Research shows that the cheapest way of reducing carbon emissions is district heating with CHP. The London Mayor has an initiative to see 25% of London’s communities served by district heating means by 2030. Vital Energi are at the forefront of the industry, when it comes to design and the building District Heating Schemes. This takes considerable expertise and experience and no one is better qualified to create tailored energy solutions than our team. 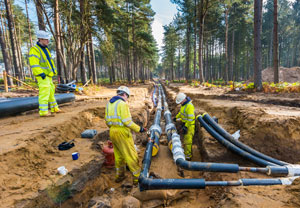 Since the 1980s, Vital Energi have been installing the most cost and carbon-efficient underground pipe networks for clients as diverse as Heathrow Airport and the Berkeley Group. 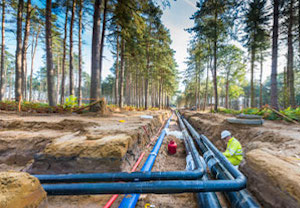 District Heating & Cooling schemes are networks of pre-insulated pipes which distribute heat, hot water and cooling from a central source and are ideal for residential, commercial and public premises or mixed use developments. These networks are extremely flexible and can be installed below, or above ground and powered by a range of sustainable energy solutions, including Combined Heat and Power (CHP) plants and heat pumps. This flexibility enables Vital Energi to design bespoke solutions for a client’s needs. The Vital Energi workforce is the most experienced in the country when it comes to District Heating and Cooling systems, with many employees involved in installing the first networks over 25 years ago. That experience is shown in the fact that our catalogue of work represents a significant percentage of the UK’s entire District Heating Networks. We are proud of our District Heating product range, which includes the most accurate alarm system on the market, detecting leaks within 1m-3m on a 10km network. We also offer a 30 year warranty on some of our pipes, the longest of its type available. By harnessing the heat which is normally lost in energy generation and by using other sustainable technologies it is possible to create affordable, sustainable and environmentally sound energy, but that is only half the process. How you distribute that energy can have huge financial implications on a business. In short, the more energy lost in transport to the end user, the more money is wasted, so it is essential that any District Heating & Cooling Network works as efficiently as possible. Our systems use the highest design of insulated pipe and our trademarked Band Muff jointing system significantly increases the design of the installation from 30-50 years, while reducing the amount of heating and cooling lost. 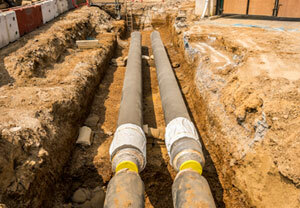 District Heating & Cooling Systems are a tried and tested technology. They have been in “in the ground” for over 25 years, meaning that there is a huge body of data showing their environmental benefits. Our pipes come in a range of materials and sizes, but our confidence is such that we offer long-term warrantees on our products and installations. The choice of insulation can have a large financial impact on a project. The highest insulation level can reduce heat loss by up to 55% compared to standard insulation levels. With over 34 years in the business, Brendan has amassed both unparalleled experience and an enviable reputation as one of the industry’s gurus on pre-insulated pipe systems, products and their design and installation. In that time, he has established close, long-term relationships with all our European suppliers. Contact Brendan to find out how we can help your project. Our Energy Centres connect 50 to 4000+ dwellings to a sustainable energy supply. This year, its likely that Vital Energi will build more Energy Centres in London than any other contractor. Typically there are low carbon initiatives for new developments, in residential terms, for over 50 dwellings. The Vital Energi London's build and design/build Energy Centre portfolio ranges from Energy Centres for 50 dwellings up to 4000 dwellings - we also cater for mixed use. 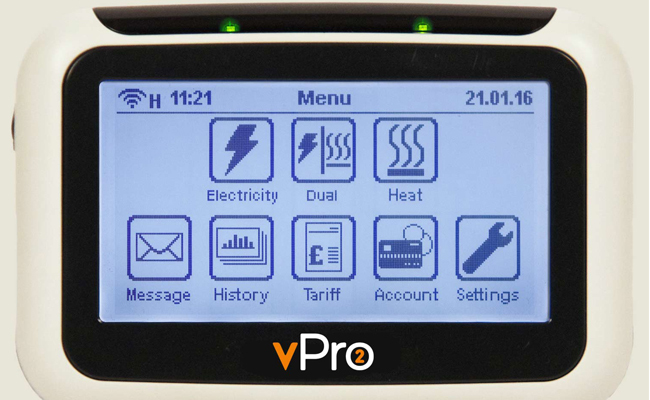 We supply and install Heat Interface Units (HIUs) and Smart Meters. Ultra-safe and highly economical, we have installed over 100,000 HIUs across the UK. 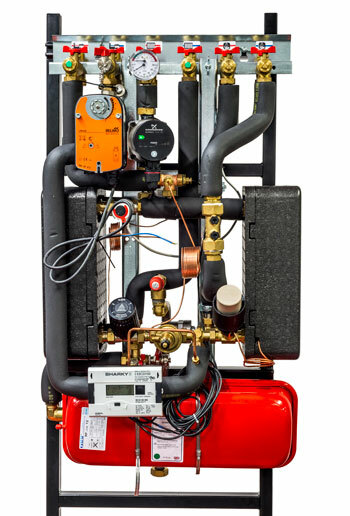 Hydraulic Interface Units (HIUs) – also known as heat interface units -make up an essential part of any residential district heating system. HIUs allow your clients to connect and access instant and reliable hot water and central heating 24 hours a day. By seamlessly connecting with central energy centres, HIUs allow consumers to access affordable, sustainable heat. When combined with our SMART metering solutions, HIU heating units give residents a greater knowledge and control over their energy consumption. We offer a range of HIUs which allow us to provide the optimum solution for projects of all types and sizes. Our HIUs are all CE marked and are based on many years’ experience in district heating. They have a proven design, with over 100,000 of our HIU heating units installed in the UK and Europe to date. There are several types of HIU and each brings its own benefits. Shared common advantages include that they are compact, need no flue or room ventilation, offer the same advantages as having an individual boiler and can contribute to an improved Standard Assessment Procedure (SAP) rating. One tangible benefit is that hydraulic interface units produce no combustion in the residence, making them exceptionally safe. This means landlords and owners don’t need a costly annual Gas Safety Check on each unit. On an 80 residence project this can result in savings of £120,000 over a 20 year period. Gas installation is covered by strict legislation and in developments such as high rises, is subject to extremely stringent and complicated planning regulations. By installing a heating system incorporating HIUs, this expensive to implement and difficult to meet legislation can be avoided as there is no need for a network of gas pipes throughout the building. 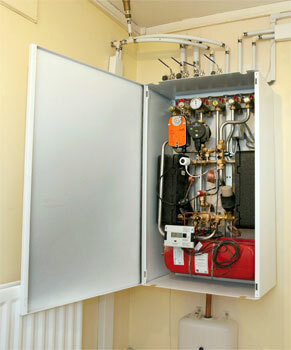 Hydraulic Interface Units allow groups of residents and businesses to access regular and reliable heat and hot water. 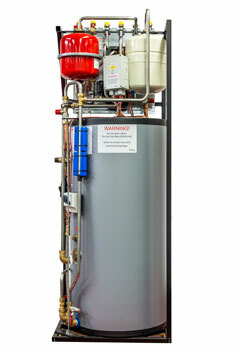 Depending on the technology used in conjunction with the HIU, this heat and hot water can be sustainable or renewable. The combination of metering and heating controls allows residents to modify their consumption. Studies have shown that when given access to information about their heat usage and its subsequent cost, residents have reduced their CO₂ emissions by up to 30%. Speak to Lee for expert advice on HIU's. Accurate, reliable, user-friendly metering helps your residents manage their energy costs, and can reduce consumption and emissions on your development. Metering and Billing is one of the most important aspects of community energy schemes and it is essential that consumers, housing providers and energy providers have absolute confidence in the accuracy and reliability of their systems. The vPro2 system has an in-home display and provides residents with all the information they need. Vital Energi offer a range of metering & billing solutions which gives us the flexibility to meet the needs of any client. While accurate metering is essential, it isn’t the only consideration. Understandable bills for consumers and flexibility of payment methods can be hugely beneficial and, when the correct solution is chosen, help residents from accruing unmanageable debt. Security is an important consideration in Metering & Billing and we ensure that our solutions are safe and secure. This is seen in every aspect of our systems, from payment security and fraud protection to data encryption. Improved information and increased awareness of energy and heat usage allows consumers to make more informed decisions about how much energy they use and how they use it. A study by Oxford University, in collaboration with Camden Council, showed that when heat meters were installed and residents were given meaningful data about their heat usage and the associated cost, their consumption decreased significantly. In one estate this resulted in a 30% reduction in CO₂emission and £400 in costs per household per year. For developers, our capacity to build off-site hugely reduces installation time and minimises the health and safety issues of on-site construction. The benefits of Pre-fabrication and off-site manufacture are numerous and compelling, and Vital Energi are at the forefront of Lean Construction. For developers, our expert capacity to build off-site hugely reduces installation time and time on site – up to 70%. We also have an even greater control over quality, can employ task-specific local labour and help to minimises the health and safety issues of on-site construction. Our in-house CAD and Engineering team produce Lean Construction 3D modelling and spool drawings tailored to ensure Right 1st Time Pre-fabrication outcomes however complex your project needs. Solar Panels are “no carbon” technology, which means they generate electricity, heat and hot water without producing any greenhouse gases and they do not cause pollution. Each kilowatt-peak (kWp) of electricity produced can save approximately 455 kilograms of carbon dioxide emissions compared with electricity generated from fossil fuels. Contact Tony to find out more about advancing technologies on the market. Are you satisfied that your energy centre is operating efficiently? Are you meeting industry compliance standards? We can help you take vital steps to alleviate unwarranted losses and maximise the performance of your energy scheme by looking at the below initial considerations. Are you satisfied that your energy centre is operating efficiently? Are you meeting industry compliance standards? We can help you take vital steps to alleviate unwarranted losses and maximise the performance of your energy scheme by looking at the below initial considerations. Are there appropriate Controls / BMS in place? Check that controls have been set up properly. Ensure the supply and return temperatures are achieving as designed. Ensure Low Zero Carbon Technologies are prioritised. Set up real time alerts for boiler failures and any other equipment in the energy centre to prevent critical issues. Is your controls system identifying heat losses? Investigate heat losses and determine whether they are unexpectedly high. Explore root causes and if they are caused by poor insulation levels or low system use. Is the return temperature too high? If the return temperature levels are too high check for open loops, incorrect control or bypass valves. Consider thermostatic controls to improve return temperature conditions. Are ventilation standards being achieved? Is there sufficient ventilation for the plant and equipment in the energy centre? Has the ventilation system been designed and installed to IGEM guidelines? Ensure working standards are adequate for employees i.e. is it too hot? Is the energy centre DSEAR compliant? 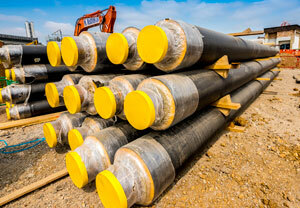 Ensure gas installations comply with regulatory standards. Protect against risks from fire, explosion and similar events arising from dangerous substances being present in in the energy centre. Review noise breakouts and ensure they comply with planning permissions. Are the noise levels causing disruption to the local community? Has the energy centre been fully commissioned? Review existing documentation around the commissioning process and make suitable recommendations. Commissioning of all plant and equipment should be fully documented. Do you have a full pack of O&M manuals? Do you have a maintenance schedule? Ensure proactive and reactive maintenance is recorded. All maintenance checks are properly logged and a maintenance log is kept updated. Is the HIU & metering operating effectively? Are your HIU’s operating satisfactorily? Testing the flow of hot water that passes through the HIU is at the right temperature and checking if it is recording data accordingly. Do you have an appropriate servicing regime? Is your water treatment up to standard? Do you have a water treatment maintenance strategy in place? Are your PH levels correct? Do you know the current level of inhibitor in your system if any? Are all of your heat meters connected and collecting data? Are you meeting the recommended run hours of your renewable technology? Do you have a dormant CHP that could be beneficial if switched on? Are your boilers regularly serviced and combustion checks carried out? With over 30 years of award winning experience in the renewable and sustainable energy sectors, Vital Energi has established itself as a market-leading innovator. With over 30 years of award winning experience in the renewable and sustainable energy sectors, Vital Energi has established itself as a market-leading innovator. Our experience has given us the unique insight into the effective operation and maintenance of energy centres and district heating through the optimisation of systems to ensure that the best efficiency and longevity is achieved enabling our clients to realise the full potential of their assets. We currently operate and maintain over 70 energy centres and district heating schemes across the UK for a variety of clients including Developers, Housing Associations, Local Authorities and Property Managing Agents. Over half of our Operation and Maintenance portfolio is located within the London region and delivered from our centrally located offices in Holborn. Our close proximity to our regional projects enables close management of client specific needs which we aim to deliver in a collaborative team-focused manner. Vital Energi’s commitment to quality has resulted in robust processes and procedures to enable the smooth transition of your district heating system into Vital Energi’s care. The transition process commences with a condition assessment of the plant, equipment and distribution system from which recommendations will be made, where required. Each project is assigned a dedicated team of experts including but not limited to a site leader, area leader, contracts manager and associated Building Management System engineer and customer contact team. This team will remain consistent for the duration of the contract during which they will build extensive project knowledge allowing identification of any trends or specific issues. Our planned preventative maintenance and reactive attendances are completed to the highest standards in accordance with the planned maintenance standard SFG20 or the manufacturer’s guidelines, whichever are more stringent. We work within the Heat Trust scheme requirements with reactive maintenance to ensure that residents receive excellent service. Our highly trained and experienced engineers will attend site on a regular basis and undertake all necessary plant checks, inspections and services of the assets throughout the duration of the Service Agreement. This will ensure that any potential problems are identified early to enable appropriate action to be taken. Our Engineers wear full protective uniform and display their ID badges to preserve security. Our vehicles are also clearly recognisable to prevent bogus callers. We remotely monitor your energy centre 24/7 365 days a year which allows the early detection of faults and dispatch of engineer to remedy the fault before your residents experience a loss of service. Our engineers utilise well-equipped, branded vehicles and state of the art technology for updating our dedicated asset management software for live reporting and will attend within the following response times.